In short, a Pissaladiere is nothing but a savoury yeast dough base (also known as Pizza dough), with a thin layer topping of onion marmalade, olives and anchovy. For a round baking tray, you’ll need 200..250g of dough. A full-size square one takes about 350g. Per 100g of strong white wheat flour, use 5g of yeast, a pinch of salt, a tablespoon of olive oil, and 65ml of lukewarm water. Knead well, then cover and let rise in a warm place. Allow for a little over one hour. I normally use very large vegetable onions (which have a bit less bite), and a few red onions (because it looks interesting), but any onion will do. The onions will lose a lot of volume, so prepare a very generous amount. Three very large vegetable onions for a round tray might be just enough. Peel, then slice thinly. You could use an electric chopper for this, provided it slices rather than grinding the onions to a pulp. I slice manually â€“ and tearfully! Add finely chopped garlic to taste. Red hot chilly peppers also work well, if you like it hot. Heat a good swig of olive oil or clarified butter. Toss the onions and garlic in the oil, then cover and let steam gently for 15 to 20 minutes. Uncover, season with salt and thyme, and allow to cook uncovered at low heat for 30 minutes at least, stirring occasionally. Be patient. Very patient. When done, season to taste with salt, thyme, pepper, a pinch of nutmeg. A spoon of soured cream is optional. Oil your baking tray. Roll out the dough, transfer to tray. Let the dough recover and rise again (allow for 20 minutes). Then, thinly spread out the onion marmalade. Top with olives and anchovy, and bake at 200C until golden. Now this site holds a recipe for Pissaladiere, or Tarte Provencale. 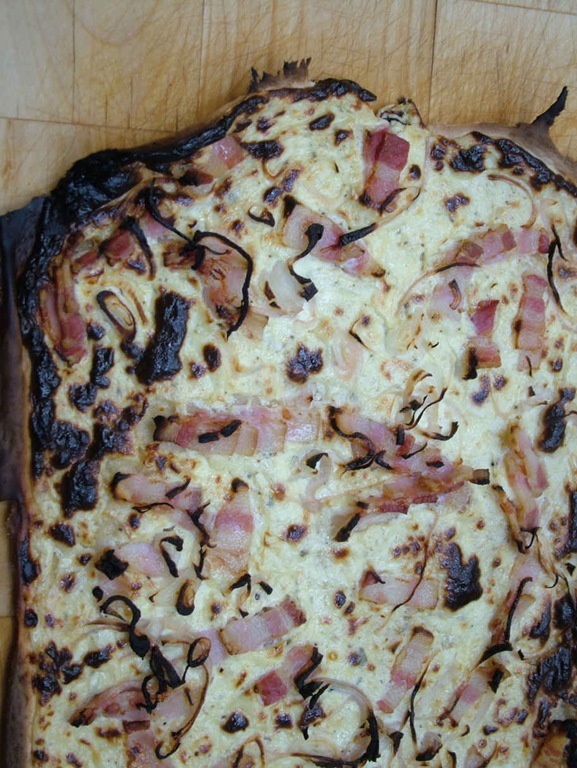 Here’s an interesting little project: Tarte Flambee (or Flammkuche), a waiver-thin crisp base, topped with a thin layer of sour cream, bacon and onions. In the olden days, we had to travel into the Alsace to get it. Nowadays, it is being served almost anywhere back around our home town, so I assume there must now be deep-frozen kits available. Not only are those kits unavailable where I am, it also spoils the fun. So, off we go to making our own! First step is to open my trusted and much loved Larousse Gastronomique. I checked two different editions under any keyword that came to mind without success. Can you believe that? 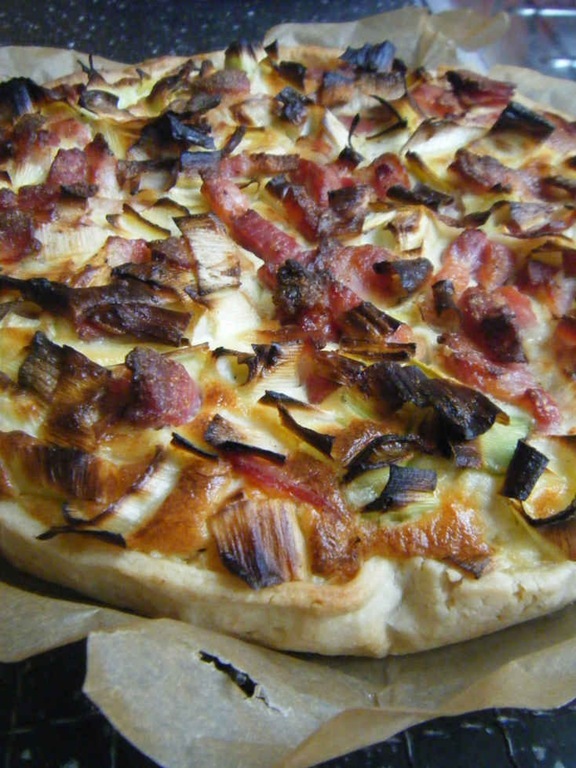 Something as typical as Tarte Flambee? If you find under which name they file it, let me know. So, with the Larousse Gastronomique failing, I am on my own. Google also failed, by providing a list of recipes and suggestion that simply weren’t acceptable. Let’s see. The base is a very poor bread dough from flour and water, maybe with a splash of milk. Very little yeast, if any. Pinch of salt. No fat. But, I hear you ask, how will you roll this out, 2mm thin, and handle it without tearing? Ah, I am really glad you asked. That’s the real challenge. Bread dough is gluey, so the shortbread crust trick (roll out between sheets of cling film) won’t work. I am working on the bases that I shall not to roll it out. To do that, I make a dough as dry as possible while still being runny, then spread it on a flat baking tray rather than rolling it out. The exact mix depends on your flour, the ambient temperature and the phase of the moon. You could start with 65ml water and 25ml milk on 100g of strong white wheat flour (bread making flour, or â€˜long flour’ as my Grandmother called it). This makes one regular sized tarte, which will feed one person. Mix water, milk and flour with a pinch of salt. Mix it well, then let sit for 15 minutes. Meanwhile, pre-heat the oven to enormous heat. 270 Celsius sounds about right, preferably in top-and-bottom heat. Prepare 100g soured cream with one egg yolk, a pinch of nutmeg and some black pepper. No salt (this will come from the bacon). Once the dough is spread out and the oven is ready, very gently top it with the sour cream mix. Spoon it on gently, don’t pour it â€“ pouring will let the cream penetrate the soft dough, and you end with one big soggy mess. Sprinkle very thin onion rings and bacon lardons on top, and into the oven with it! Bake until the edges of the dough turn very dark, then continue baking until the edges actually turn black, then continue baking for as long as you dare. The problem is that you still have to get a lot of moisture out of the base, which is now covered with a layer of sour cream. Once you can’t stand it any longer, get it out, transfer it onto a board, cut into six or eight large pieces, and enjoy immediately. Preferably made from ready-diced rabbit, so that the whole business of dealing with the carcass of the whole animal goes out the equation. Unlike other rabbit dishes, where you’d want the whole legs, for example, this is a stew. Only walnut-sized pieces of meat required. Get the beans going first, as they need more time than the rabbit stew. Fry some tiny bits of bacon, a small and finely chopped onion, then gently steam the green beans in just a tiny splash of water. When the beans are about 10 minutes on their way, shallow-fry a handful of dry-cured bacon. Add a small and finely diced onion, and a crushed small clove of garlic. Then add a bit of olive oil and the meat, which you tossed in a mix of one tablespoon of white flour and one table spoon of mustard powder. Add crushed black pepper. Fry and stir until it colours nicely, then add a glass of dry white wine and stir-in a large teaspoon of nice hot mustard. Put the lid on and allow to simmer for 10 minutes, then season to taste using salt, black pepper, nutmeg, and more mustard. 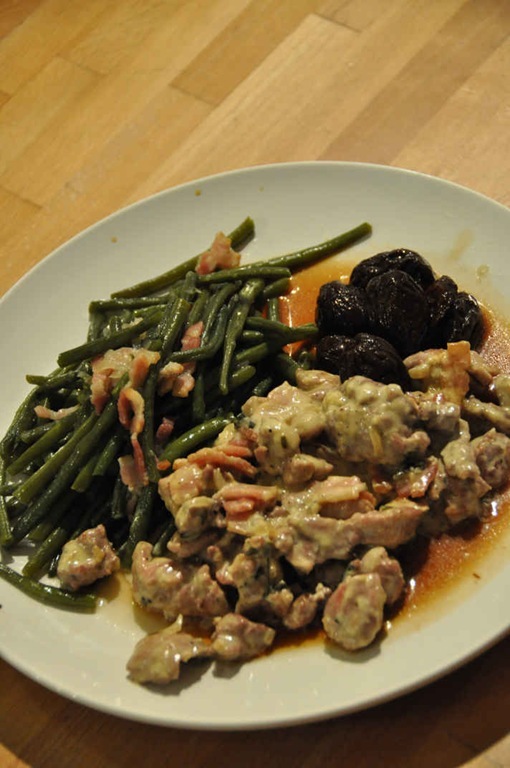 Add two tablespoons of prunes to each portion. Simply use the canned stuff, with a bit of the syrup. I suppose you could also substitute the rabbit with goat or crocodile, but I haven’t tried those yet. The local butcher regularly stocks goat meat, so this could be worth an experiment. We made some last minute shopping back home, just a quick trip into town and to the local farmers’ market on the Saturday morning to buy two large heads of curly Endive. Interesting to read-up on Endive in my new copy of the great Larousse Gastronomique (Thanks to Santa! 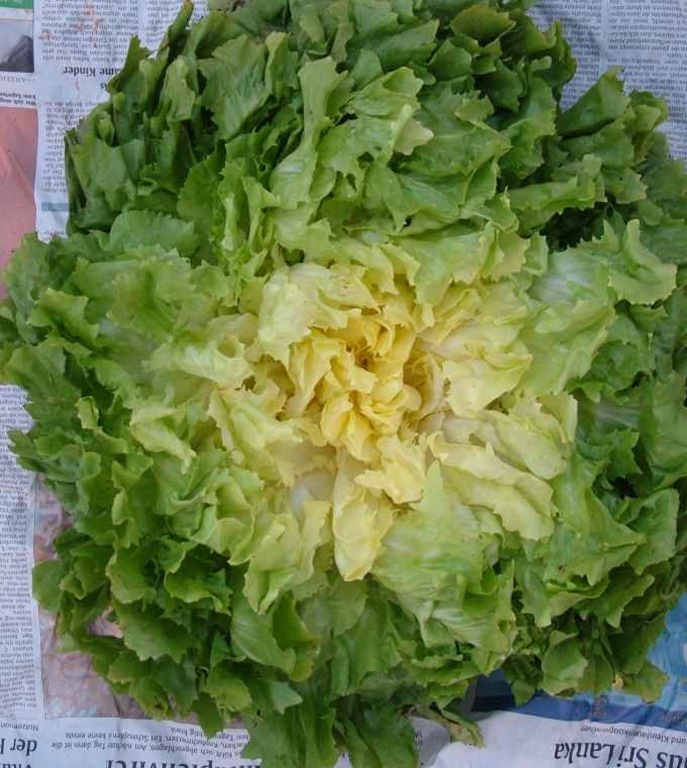 ), which explains the relation between Endive, Frisee and Chicorée, and explains that what is Endive to some (Britain, Italy, Germany) is Chicorée (or Chicory) to some others (France, USA). There’s also Radicchio from the same family, and Red Chicorée (whose strength is chiefly in being decorative rather than tasty). No wonder there is confusion in all this. This is no excuse for not growing or for not selling curly Endive, as depicted here (whatever you might prefer to call it) on my local market in W7.Â No excuse at all. I saw seeds on sale in the local garden centre some while back. Once our building work is done and our garden has been restored to a new and better place, I’ll have to start another battle against the slugs when trying to grow my own. Not everyone will have the time to view all 532 photos taken during our trip to Brittany, so I extracted a subset of 91. You can see the 91 public ones online on Flickr here. You can also log on to Flickr and register as a friend or family member to get access to the full collection – it’s worth it; very few of the 532 photos are not good and most are excellent. A had tip, a shoulder clap and a kiss for the good wife, who shot almost all as always. This time I really am out of the office – we are off to our holidays, dodging the rain and cycling through Brittany (France) or somewhere further south in France if the Biscay sends too much ghastly weather to the rough shores of Brittany. Not quite in the 1978-style boy scout tent, but tent and bicycle and no car nevertheless. What? Oh yes. Thank you. Yes, we'll have a good one Back on the 23rd. Hmm. Not quite as far as I expected, but still… That’s 3/4 of a marathon, the 2001 Tour de France stage 11 (Grenoble to Chamrousse), or the diameter of Siarnaq, one of Saturn’s outer moons. Likewise, I have eaten no less than half a ton of coarse oats in my life, drank well over 20,000 litres of water, and will have consumed close to 1,000 bulbs of garlic. No vampires around here, I tell you! Now that we are back from the Harvest Season review, I am wondering: Back in the home country, the air is balmy, fresh, and clean. The nights are quiet and full of stars. There is a fantastic forest, practically no traffic, friendly people and a rich local cuisine. France is just a stone throw away and the rest of continental Europe is in easy reach. Life runs at a more human pace, the wine is both good and cheap. Plus, it was at least 5Â° warmer than here, and it didn’t rain. Yet driving back into London last night gave me a warm feeling, and I am happy to be back here. I love living in London. Surely, this is where I have my stuff and my social circle, my cat and my house, but what exactly is it that makes us like London so much against all odds? I guess the multicultural aspects as well as the rich cultural offerings count for a lot, but I can’t help thinking that the disadvantages would probably outweigh the advantages of living in London, if you made an unbiased judgement of every single aspect. Is the total greater than the sum of its parts? The good folk of Feedmap use Microsoft Mappoint Technology to provide maps showing blog locations. Something is not quite so good in all this technology; as you can see from the little picture here, London is quite thoroughly wiped out at certain zoom level. Don’t panic. We are still here and enjoy a good life. Maybe this is just indicative of the summer holiday season and based on the fact that many Londoners are actually out of town these days? I double-checked France, but Paris is still there. Maybe it was just wishful thinking: with proper camouflage we might escape terrorists and tourists alike?